Last time at L'Abattoir, JS and TS had to jet shortly after finishing their meal. Thus, they left me with paying their bill. No matter, since I knew we'd be eating together sometime in the near future. The near future really didn't come soon enough. Yes, there were other opportunities to eat with one another; but I was really busy. Not to mention, being away for a whole week in Portland. With a bit of free time this week, I suggested we get together for lunch somewhere. Now this may seem like an easy exercise. Nope. We really didn't have any ideas as to where to eat. In fact, I had to go into Urbanspoon to get some ideas. Our minds were completely blank! Well, that is not a stretch for us really... So the ideas started off small, such as Jules Casual French Bistro. Then for no apparent reason, TS suggested Le Crocodile. Uh... That's not an inexpensive place! Well, one look a the lunch menu and it wasn't too bad. So off we went to Le Crocodile. I managed to find a parking spot right across the street on Smythe. Not really unusual during a weekday since the spots here are so freakin' expensive. I kept feeding the meter throughout my meal. I think it was enough to get another entree! From the very start, it was quite obvious that Le Crocodile is all class. From the tasteful decor to the attentive and professional staff. One thing that I noticed was the attention to detail from the staff. Trust me, in Vancouver, this is not a given. It's amazing how crappy the service is in this city. It is no wonder why we have no Michelin-rated restaurants. I digress. So after careful and deliberate planning, we figured out our selections. You see, TS/JS share the same ordering technique that I employ. No duplicates! Nice. 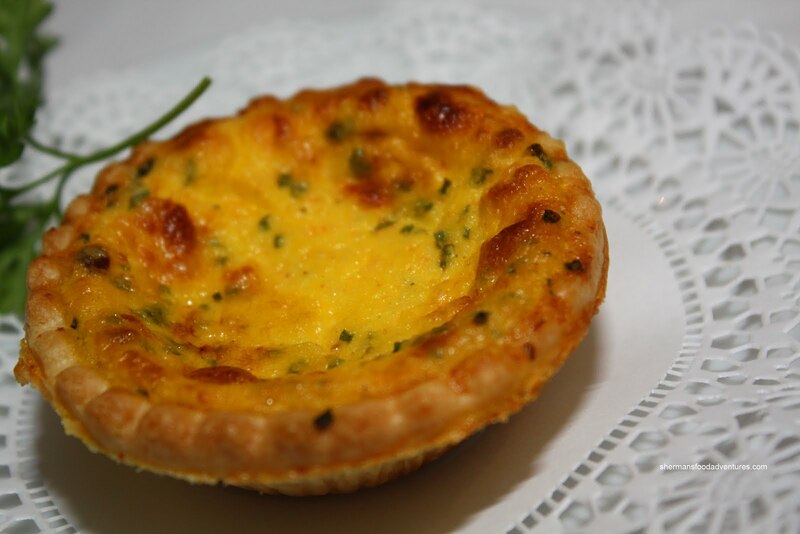 To begin, w e were presented with an amuse bouche consisting of a Crab, Cheese and Chive Tart. Pretty big for an amuse bouche, only someone with a big mouth could eat that in one bite. No, I didn't eat it in one bite! And I don't have a big mouth! Well, not really... Soft with subtle flavours, it was a nice start to the meal. Not expecting the amuse bouche, JS ordered the Onion Tart. A bit of a redundant item; however, only in concept, not taste. There was a pronounced sweet onion flavour which was front and centre. 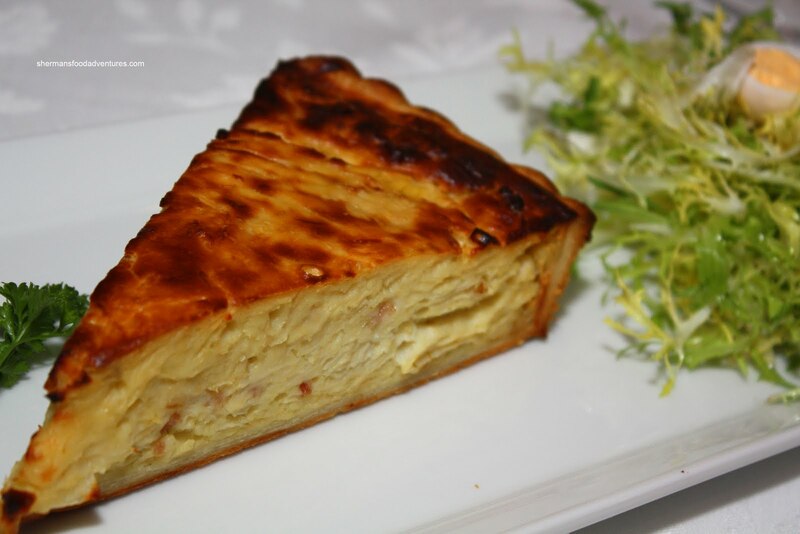 For a tart, the taste was clean and there was no mistaking that it was made of onion. 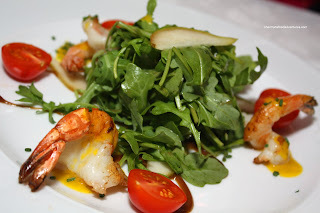 TS got one of the appetizer features being the Prawn Salad with mango sauce. I got to sample some prawn and in addition to being perfectly cooked, there was a strong grilled prawn essence. This was a very enjoyable taste and it was naturally flavourful. Being a bit ambitious, I decided to employ the Truffle Omelet as my appetizer. You see, it is actually an entree and our server warned me that it is not small item. Nah, it's French food, how big could it be? Well, look at it... There is a full plate of food here including the decent-sized omelet to the mound of frites to the plentiful butter lettuce salad. For me, I needed to try the omelet. For such a simple item, it requires plenty of skill to properly execute. This one was excellent. Nicely browned on the exterior giving way to a fluffy soft interior, this is skill in action. One complaint would be the excess use of salt which overwhelmed the truffles. As for the frites, they were very good being crispy and properly seasoned. We all kept munching on them with much content. The butter lettuce was fresh and only lightly dressed. So with that "appetizer" out of the way, my main course arrived. 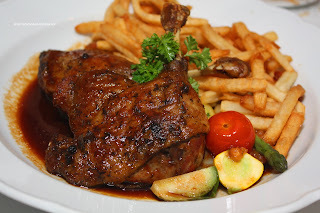 The Duck Confit consisted of two meaty duck legs! We were beginning to realize that the portion size here is quite large. Most of the leg meat was tender except for some parts which were a bit tough (mostly on the exterior). The skin was not crispy in this case; rather it was the soft, melt-in-your-mouth version. I'm not complaining. The star of the dish had to be the demi-glace. An intense red wine flavour tempered by a savoury-sweetness brought the duck meat to life. JS opted for the Chilean Seabass with lobster beurre blanc. I was given a huge piece to taste and the first thing that str uck me was the sauce. Absolutely delicious. 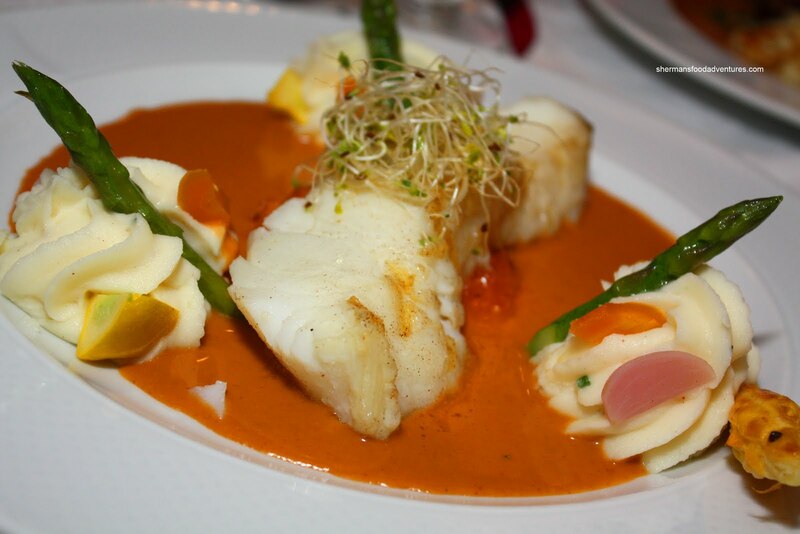 It was like the perfectly cooked fish had been sauced with a lobster bisque. Once again, we were not complaining. The buerre blanc was rich with a powerful lobster essence. TS decided to get a "meat" dish since JS had fish. Careful planning, I tell ya... 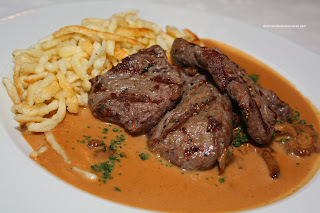 So she had the Venison Medallions in a chantrelle sauce with spatzle as a result. She asked for it to be medium-rare and it came out closer to medium. However, that really didn't affect the net result since the venison turned out to be very tender and not that gamy. The rich chantrelle sauce was understated; yet luxurious. The spatzle was very buttery. 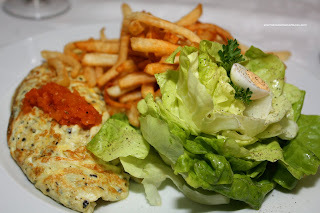 Every table received a side of Shoestring Frites to go share with their meal. It was quite the novelty to eat. Crunchy and lightly salted, it would make a great snack. Compared to the actual frites, we could've done without these; but since they were complimentary... 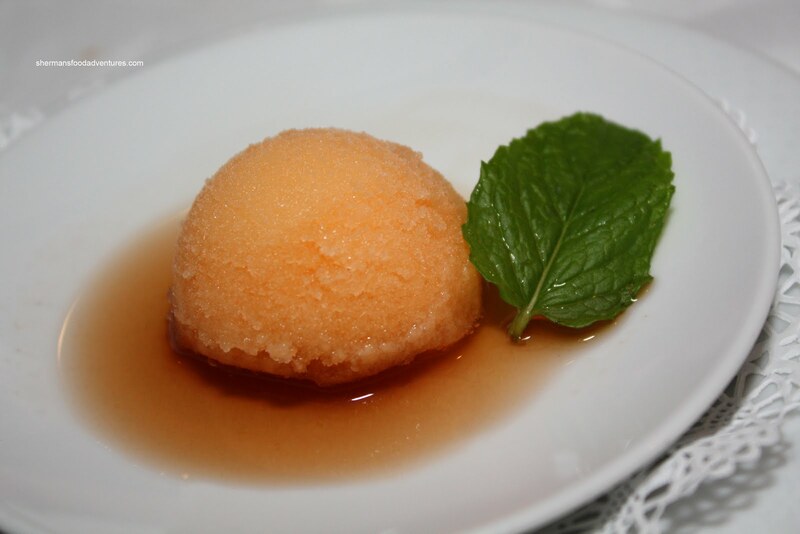 While we were deciding whether to have dessert or not (since we were so stuffed from the large portions), we were presented with a palate cleanser in the form of Cantaloupe Sorbet with port syrup and mint. This was very good since the sorbet tasted exactly like eating a cantaloupe. Furthermore, the little bits of cantaloupe added texture and flavour. We thought that the port syrup was too sweet and detracted from the natural sweetness of the fruit. We were not hungry; but buckled under the pressure and decided to share 2 desserts. 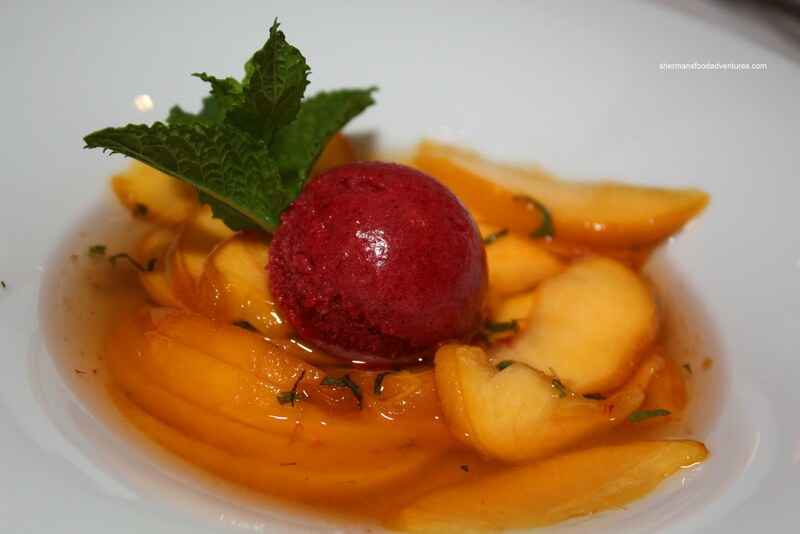 The first of which was the Marinated Peaches in Mission Hills ice wine and mint with raspberry sorbet. We really enjoyed this refreshing dessert. The peaches were sweet; but not too sweet with a nice hit of mint. Alright, I know we came for lunch and I'm sure dinner service is probably more upscale. However, for the price we paid, we got a lot of food. The portion size was definitely more country-style. Disregarding the portion size, the food itself was very well-executed and delicious. Service was impeccable, probably some of the best I've had in a long time. Very professional and knowledgeable. 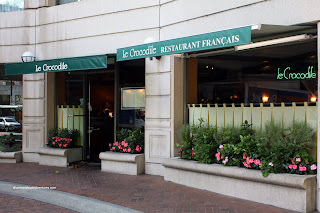 Le Crocodile is definitely more traditional than some of the newer French eateries in town; however, in my opinion, it sets the standard in Vancouver. Talking about "fine dining"... First Tojo's and now Le Crocodile. What's next??? Bishop? Cioppino's? Market? Blue Water? Gotham? Oh, wait... You have done all of those already!!! Given I work in Downtown, I could (somewhat) easily go to Le Crocodile for lunch one of these days. However, I think it is one of those places you leave it as a special occasion. Until then, no post of this place for me! LOL Kim. Every meal can possibly be a special occasion for me! I've always wanted to go to this place! :D Now I'm drooling! Anita, it is a must visit!